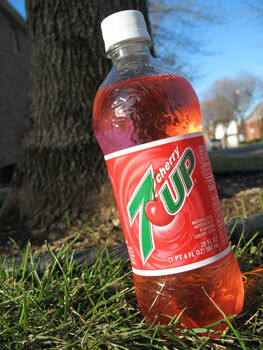 Yes the picture above is the old Cherry 7-UP, not that new antioxidant crap. Thinking way back to when I was about five years old, I used to actually stay over and hang out at my grandmothers house while my parents worked. Between watching game shows and cartoons, my grandmother would call me into the kitchen for a sandwich and my favorite soda. My grandmother is ninety years old and this is a link to past and a close connection we had. For me it brings back very good memories. Recently, though I cannot find I can not find the exact soda we used to drink. But I did buy the newer 7-Up and me and my grandmother had a old time sandwich. I had corned beef, clow slawn, and a half sour pickle. My grandmother had a beef tongue, mustard, and we both had a glass of Cherry 7-UP and reminisced about her old house, old friends, and old memories. So in the comments mention a beverage that brings back memories of the past and give us a story attached to it. When I was in my early teens in the 70s, I got to spend summers with my grampa in Miami. His goal was to be as grumpy to us as possible while keeping us well entertained and well fed. We loved him for it. One summer, he sent me to beginning tennis lessons. I was terrible at it, but it was fun and my instructor was, in the parlance of the day, a fox. Afterward, I would cross the street, get a cold bottle of Mountain Dew from an old fashioned soda machine in front of a gas station and wait for my grampa to pick me up. It was so refreshing and delicious and every time I drink Mountain Dew I always try to regain that feeling. With the advent of high fructose corn syrup, I fail. I just had my first taste of Mountain Dew Throwback and it was like that scene in Ratatouille, when Ego tastes the ratatouille for the first time. I zinged right back to a hot, humid day in the mid 70s, waiting for my grampa. He’s no longer with us, but I will be thinking of him with every drink of this fluorescent, sugary, overcaffienated delight. #1: Cactus Cooler. Granted, this was an 80’s thing for me. A friend of mine tried to get me to try it out of a gas station soda machine (what’s up with gas station soda machines Robin??) and I couldn’t imagine what weirdness would come from a soda named after a succulent. Then I tried it. My sadness comes from not having seen it around where I live right now… maybe the internets can help me. #2: RC cola. SW La. in the summertime. Walking to the grocery to get cigarettes for my Mom (this was another age, people) and having the change leftover to grab an RC from the “old fashioned soda machine”. It served sodas in glass bottles, so I would usually drink it right there and get the 5 cent redemption for giving them the bottle back. Good times.